I've never made a blueberry pie. I've made apple pie. But not blueberry. At work last week, one of the chefs at a local restaurant requested 3 fresh blueberry pies. Well, I couldn't say no, not to a chef! 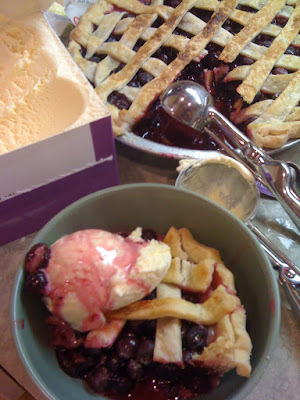 So I got my Pillsbury cookbook out and also reviewed a couple of recipes on Allrecipes.com to find the best recipe for a Fresh Blueberry Pie. After some tweaking, I think I found the best of the best. Preheat oven to 400 degrees F. Mix sugar, flour, cornstarch and salt in small bowl. Sprinkle over the blueberries and toss lightly to coat the berries. Line the pie plate with pie crust. Pour the blueberry mixture into the crust. Pour the juice evenly over the top of the berries and also dot the top with butter cubes. Roll out the remaining pie crust into a long rectangle at least 10" wide to over lap the pie plate. Using a pizza cutter, cut 1/2" - 3/4" strips for the lattice top. Weave in and out on the top of the pie to make lattice top. Crimp and press the edges of the pie. Using a pastry brush, brush the top with milk and sprinkle with raw sugar. Cut 4" strips of tin foil and make a band to cover the crust edge to avoid burning while baking. Remove the tin foil in the last 15 minutes so the crust can brown. Bake at 400 degrees F for about 45-50 minutes. Allow to sit at room temperature for at least an hour so the juices don't run everywhere. Holy Moly! This is delicious! And of course I didn't wait and mine juiced up pretty good. Which was fine with me since I put a big ole scoop of vanilla ice cream on top and then used some of the juices as a syrup over the top. After it sat in the fridge for a day, the juices relaxed and melded perfectly! I can't wait to see what she thinks of the pies. I hope she'll love them. The lemon/lime juice make a HUGE difference in the pie. Found you on $5 Dinner recipe link, this looks great! looks great!! you did a great job with the crust! Blueberry pie is one of my favourites - and yours looks beautiful! Oh my - if only my pies looked as good! 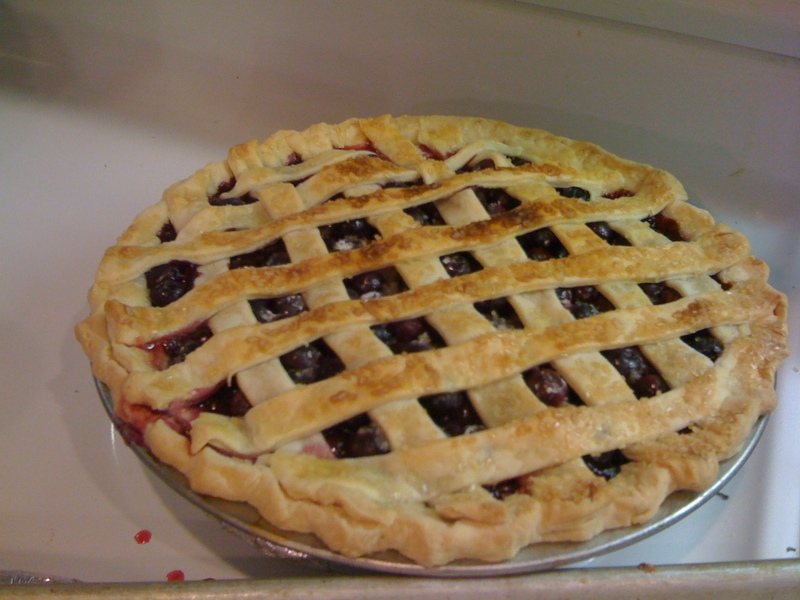 Oh, your pie looks delicious and I could go for a slice of it for breakfast now. The crust looks great! I'm new here and so happy to find your blog. Looking forward to future posts! I LOVE LOVE LOVE blueberry pie! Yours looks fabulous - thanks for sharing!